IthacaOwners.com • View topic - Finally got a Colt Bisley Model! Finally got a Colt Bisley Model! I finally found a nice Bisley Colt at a fair price and in .45 Colt no less! The brown truck of happiness dropped it off today and she is a beauty! I've always liked the Bisley grip, but always either passed then up based on caliber or felt the need for another gun more than a Bisley Colt. I stumbled on this one the other day and jumped on it, 5.5" barrel, .45 Colt, real nice condition inside and out, made in 1898, and the price was right. It sure does feel good in the hand! The weather still isn't exactly great for shooting here, but I suspect there'll be a few fired out of this grand old lady tomorrow. What year was it made...? First generation, 1898 according to the serial number. Different loads will hit different POA/POI...so, make sure you buy a few boxes of different offerings to test the sights. Not yet, I just got it Friday, measured the cylinder throats and was surprised they're pretty uniform at .454". My 1904 Colt New Service throats are out of spec at .448". I'll cast some Lyman 454190's up and load some black powder cartridges for it and maybe next weekend the weather will be more shooter friendly. OK...post a range report here when you find the time. You bet! Nothing better than an old Colt that still has some life in her. 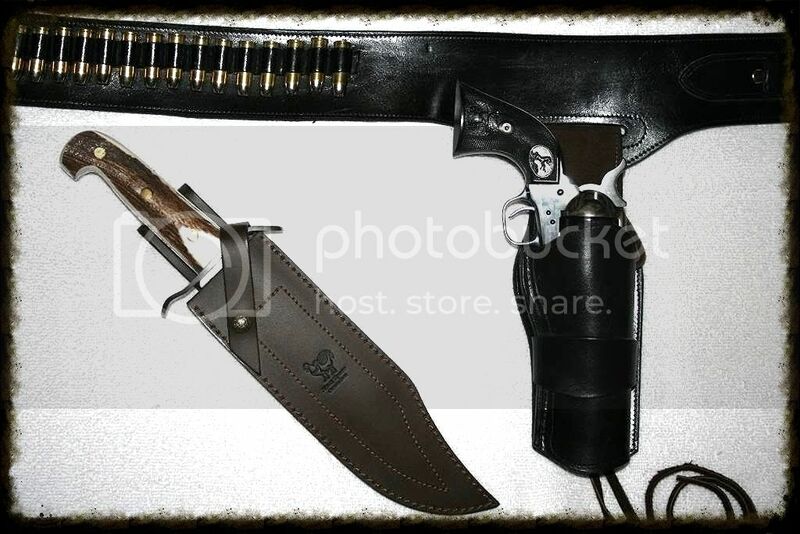 I just ordered an El Paso Saddlery holster for the old gal, nothing fancy, just a base non descript type 1890's style. Good looki'n guns there SHOOTER13! Those Rugers are indestructible! I kinda winder how the Ruger Bisley grip compares with the original Colt. I had several Colt SAA's, the best of them was a 3rd. gen. with a 7.5" bbl in .44Spl. I never shoulda let that one go, I like the .44Spl a lot. There's just something about a genuine single action Colt though! I love the Bisleys, they just scream 1890's to me! Thanks Krag...that Ruger IS built like a tank !! The original Bisley grips on your Colt are much more curved...and though I did handle one at a gun show, I've never shot one with those original grips. My Ruger handles well with the grip provided...especially with the .357 Magnum loads. Yes indeed, you'll not go wrong choosing a Ruger single action for durability. I've never owned a regular Blackhawk, but did shoot a Super Blackhawk in the 80's. 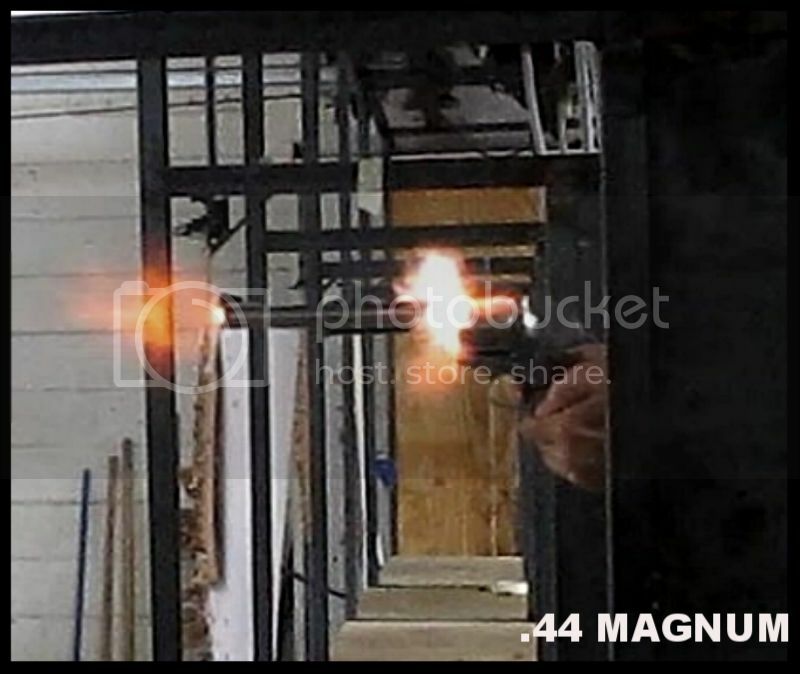 Most accurate .44 Magnum I ever had. I often wondered why they used a square back trigger guard on those, didn't seem to effect me, but I wondered what the logic in that was. 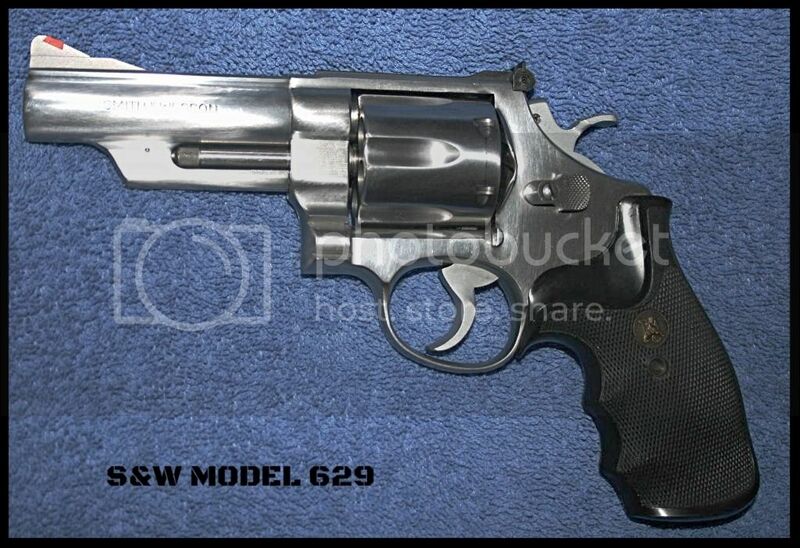 My current .44 Magnum is a 8.375" S&W 629-3 and I love it. I just like plinking with it, a Lyman 429383 246gr. RN cast bullet over a light charge of RED DOT for a mild, "POW" instead of a "ROAR!" makes it an all afternoon plinker for rouge rocks, cans, clay targets, well, anything breakable and reactive really at random ranges. A small group of us would get together and shoot pistols and revolvers for some informal competition and that's when I made the revolver shot of my life. My Colt New Service .45 in hand after I put my 1911 away. The target was a 2" stick on dot posted at 50yds. on a new cardboard backer. The guy closest to the dot would win, it had to be a single hand, off hand shot. I raised my Colt and nailed the dot almost dead center, the rest of the guys didn't even bother shooting. Lucky shot? You bet it was! It was normal to shoot paper plates at 100yds with the Ruger Super Blackhawk, it was that accurate. Yea...the square back on the SB trigger guard requires a different grip or it will bang your knuckles. I tried the Ruger Redhawk when they first came out, but they seemed way too big, might as well carry a carbine. I went back to the S&W, but in stainless for my second one. It started out a 4" (got a heck of a deal on it!) but due to forcing cone issues I swapped out the barrel for an 8.375" and have had nothing but pleasure shooting it since. I think the .44 Magnum is the most versitile revolver cartridge ever. It'll do most anything a revolver is capable of from plinking with light cast loads to bear defense. I guess you can visit and still shoot them which makes for a good decision on your part. Those Colt "snakes'' are getting pretty pricey here as of late. I didn't even have to fill out any paperwork for the Bisley since it's considered an antique here. You and your shooting pals are welcome here anyday! Sounds like a nice collection Impala...too bad about those Brit gun laws. krag96 wrote: I guess you can visit and still shoot them which makes for a good decision on your part. Those Colt "snakes'' are getting pretty pricey here as of late. I didn't even have to fill out any paperwork for the Bisley since it's considered an antique here. 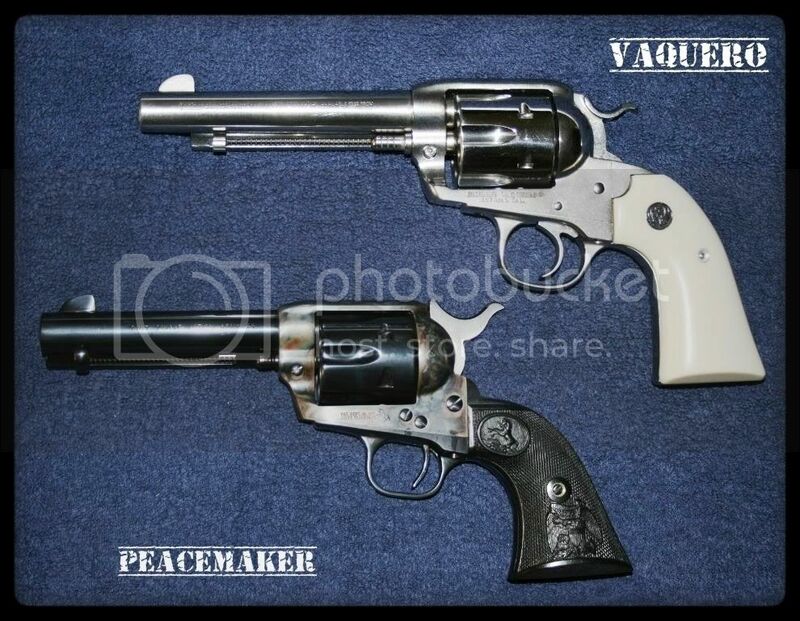 Edit.....For your interest I could actually own a Colt Bisley as it would be classified as a classic gun. I could not keep it at home though, it would have to reside at the NRA armoury at Bisley camp in Surrey where I could shoot it by appointment. Many UK shooters kept their classic pistols with this restriction, my Colt 'snakes ' did not fall into this category and personally it was one of the reasons I gave up shooting for quite a while. Glad I came back to it though, I made many great friends through the shooting sports and now continue to do so. Both at the range and online. It's a fact that shooting is one of the only totally equal sports, available to young and old , regardless of gender, disability or any other traits that seem so divisive in this day and age. Just wish our NRA had the clout that yours has! Glad to hear you can still at least own one and shoot it occasionally! What constitutes a classic handgun in England? I too wish your NRA had more clout. Ours is a powerful arm for freedom that every gun owner should support. I believe that it is 'manufactured pre 1945' (but don't quote me as I have not really investigated this avenue) I must say that engaging in this topic/conversation has perhaps nudged me to check it out, a classic wheelie would be a fun piece to shoot again! Right you are. I've talked with some shooter's from Italy on the cast bullets forum and am surprised at the LAX for Europe anyway gun laws.